CAMHS are specialist mental health services for children and young people. They offer assessments and treatments for children and young people who have emotional, behavioural and mental health difficulties. 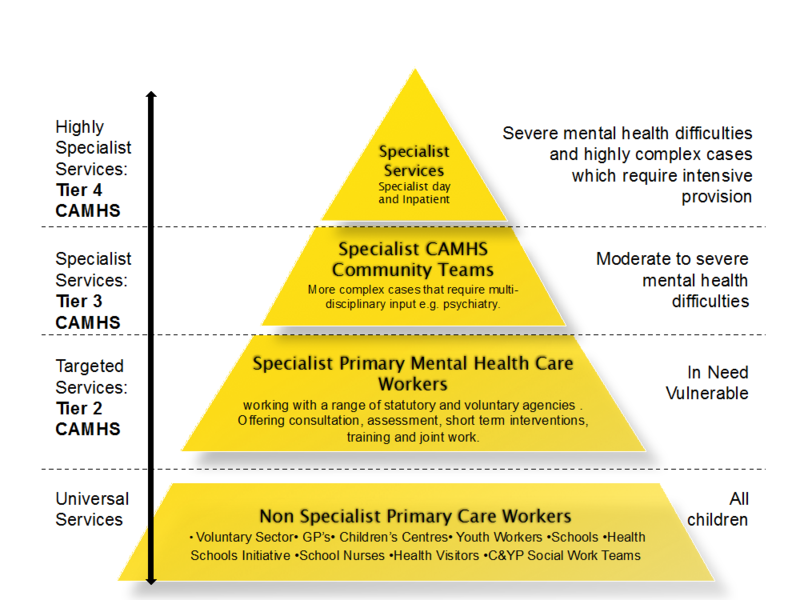 In Richmond and Kingston, Tier 2 CAMHS services are provided by Achieving for Children. This service is called the Emotional Health Service which has an early intervention approach for children and young people, who experience prolonged periods of emotional distress and present with difficulties that fall within the mild-moderate range of mental health disorders. Tier 2 offers assessments and treatments with the aim of helping to improve a person’s ability to function and cope with the difficulties that they have. To access this service, a child or young person has to live in the boroughs of Richmond and Kingston. Tier 3 and Tier 4 services are provided by South West London and St George’s Mental Health Trust. Tier 3 offer assessments, diagnosis and treatments to children and young people who have signs and symptoms of an emerging mental health disorder which is having a global impact on their ability to function. Tier 4 offers inpatient services for children and young people with exceptionally high levels of distress and complex mental health disorders. To access these services, a child or young person has to have a GP registered within the boroughs of Richmond or Kingston. The Emotional Health Service and Tier 3 CAMHS will offer a Choice appointment to assess the presenting difficulties a child or young person has. During this appointment, a range of options will be provided; the child and young person will then choose their preferred option. If a young person has an Eating Disorder, there is a specialist service at Springfield Hospital where they will be referred to from Tier 3 CAMHS. For a comprehensive assessment and diagnosis of ADHD or ASD, both the Emotional Health Service and Tier 3 CAMHS will refer a child or young person to the neurodevelopmental service at Springfield Hospital. Other boroughs may have a slightly different set-up for CAMHS. Search online for ‘Child and Adolescent Mental Health Services’ in your area. Your local NHS Trust website should have the details. It is highly likely that your child will still need to be referred by a professional.